Race 2 is a 2013 Indian action thriller film directed by Abbas Burmawalla, Mustan Burmawalla and produced under the Tips Music Films banner. It is the sequel to the 2008 film, Race and the second installment of Race film series. It stars an ensemble cast of Anil Kapoor, Saif Ali Khan, John Abraham, Deepika Padukone, Jacqueline Fernandez, and Ameesha Patel in the lead roles while Aditya Pancholi and Rajesh Khattar are featured in supporting roles and Bipasha Basu is featured in a special appearance. Khan, Kapoor and Basu reprised their roles from the previous film. Made on a budget of ₹940 million (US$13 million), Race 2 was released on 25 January 2013 and opened to mixed reviews from critics and positive response at the box office, earning ₹1.62 billion (US$23 million) worldwide. According to Box Office India, it was declared a semi-hit. The story continues from the previous film. A robbery takes place and European printing plates are stolen. Ranvir Singh (Saif Ali Khan) goes to a casino owner, Vikram Thapar (Rajesh Khattar), claiming to have been behind the robbery. He offers Thapar €1.5 billion in counterfeit currency in exchange for €500 million real banknotes. Thapar agrees and borrows the €500 million from ex street-fighter and billionaire gangster Armaan Malik (John Abraham). It is then revealed that Ranvir never stole the printing plates, and was conning Thapar. Now, unable to return Armaan's money, Thapar is forced to give Armaan control of five casinos that he owns in Istanbul, Turkey. The con is a plan that Ranvir made a week earlier with Armaan, who he met through Robert "RD" D'Costa (Anil Kapoor) and his dim-witted assistant Cherry (Ameesha Patel). Ranvir gives Armaan ownership of Thapar's casinos in exchange for a 10% commission. The two become friends and business partners while Ranvir begins a romance with Armaan's half-sister and 50% shareholder Alina (Deepika Padukone). Ranvir meets Armaan's girlfriend Omisha (Jacqueline Fernandez) and sees a picture of his deceased wife Sonia (Bipasha Basu) in her wallet. He begins to woo her in order to gain her confidence. His real plan is to bankrupt Armaan because Armaan and Thapar were responsible for Sonia's death. Omisha tells him that she is Sonia's sister. Ranvir plans to steal the Shroud of Turin and sell it to Armaan. Afer that, he will steal both the shroud and Armaan's billions of dollars. However, RD, who is afraid of Armaan, betrays Ranvir and tells Armaan the truth. Armaan asks Godfather Anza (Aditya Pancholi) to give 15 billion euros as an investment. However, Armaan has to win a fight with fighter Typhoon. Alina reveals Armaan was the one who planted a bomb in her car to kill her, and decides to help Ranvir. Ranvir steals the shroud while Armaan wins his fight with Typhoon. During the celebration, Alina poisons Ranvir's glass. As he slowly dies, Armaan reveals that thanks to RD, he knew his plan and Alina was never on Ranvir's side. Omisha is also on Armaan's side and is not Sonia's sister. After Ranvir dies, Armaan and Omisha retrieve the shroud and leave in their private jet. There, Armaan points his gun at Alina, revealing that he'd been planning to kill her to take her share of the money. Suddenly, Ranvir crashes through the wall; Alina never poisoned his drink. Alina tells Armaan that she is on Ranvir's side, knowing Armaan was trying to kill her. Ranvir reveals that RD never betrayed him; he himself told RD to inform Armaan of the real plan to make Armaan think he was ahead of Ranvir. Ranvir and Armaan have a lengthy fight in the plane. Armaan tells Ranvir that he killed Sonia because she fled with his money. He shoots the pilot and all the parachutes, escaping with Omisha and leaving Ranvir and Alina to die in the resulting plane crash. However, the two manage to escape using Armaan's car, which floats on four attached parachutes. Armaan and Omisha hand over the shroud to Godfather Anza. On inspection, it is revealed to be fake. When Anza asks for his Bearer Bonds, they are also fake. Armaan is forced to hand over his properties, including cars, casinos and yachts, in place of the money, while Omisha dumps him for Anza. Bankrupt, Armaan vows vengeance on Ranvir, who had planned this from the beginning. In the end, Ranvir visits Sonia's grave and gives RD his share. When RD asks about the real shroud, he reveals that he never stole it and it is still in the Church. Alina had switched the real Bearer Bonds when he and Armaan were fighting on the plane. RD says that he does not want to risk his life again and makes Ranvir promise to never meet him again. Ranvir warns RD that promises are made to be broken. After the success of Race (2008), Ramesh Taurani registered Race 2 as a title and Abbas-Mustan said that they would go ahead with a sequel "if we get a script in place which is even better than the original." The screenplay was written by Shiraz Ahmed who also wrote Race. Saif Ali Khan and Anil Kapoor were the first to sign on in November 2009 and were reported to be the only returning cast members from the first film. In June 2010, John Abraham was signed on to play the antagonist and Kareena Kapoor and Priyanka Chopra were approached to co-star opposite Khan and Abraham respectively. However, Kapoor turned down the role as she didn't want her pairing with Khan to get repetitive; Chopra opted out due to scheduling conflicts. It was also rumoured that Asin had been shortlisted to star alongside Khan; however Padukone was cast. In December 2010, Sonakshi Sinha was cast as a replacement for Kapoor. Chitrangda Singh was approached for a role opposite Anil Kapoor in May 2011 but eventually dropped out for unspecified reasons. Ameesha Patel and Mallika Sherawat were considered for that same role, but it ultimately went to Patel. The first Indian schedule began on 5 November 2011 in Mumbai for 15 days, wrapping up on 20 November. Meanwhile, Sanjay Dutt was in talks to join the cast, but he dropped out due to scheduling conflicts. The second schedule commenced on 23 January 2012 in Mumbai. Padukone dropped out within six days because the film was always being rescheduled. Race 2's producer Ramesh Taurani released a statement to the media deeming Padukone's behaviour as "unethical, unprofessional and unacceptable". Also, it was reported that Asin was offered the role to replace Padukone, although it has been rumoured that she declined the offer, thus avoiding any controversies regarding her and Kapoor. However, Padukone and Taurani agreed on a settlement after much negotiation and the filming continued as planned. Fernandez, Abraham and Padukone joined the cast in May at Istanbul for the third schedule. On 7 October 2012, shooting was completed. The Mardan Palace in Turkey was the setting for many scenes where it was shown as the home of Padukone and Abraham's characters. The soundtrack of Race 2 is composed by Pritam. It has four main tracks. The tracks "Lat Lag Gayee written by Mayur Puri," "Be Intehaan written by Mayur Puri," and "Party on My Mind" sung by KK, Shefali Alvares and Yo Yo Honey Singh, songs became extremely popular and were declared chartbusters. The soundtrack received positive critical reception. IBN Live gave it 4/5 stars saying, "Race 2's soundtrack is racy to the core. In a nutshell, the album is bound to be a hit. Let's just hope the movie is as good as the soundtrack is!" Shresht Poddar, of Score magazine, gave the album 3/5 stars saying, "Personally, as a standalone album with no biases, it is enjoyable but it could have done with better lyrics. The tracks are foot-tapping and they would appeal to the masses. But if you compare it to Race, the album undoubtedly falls flat." 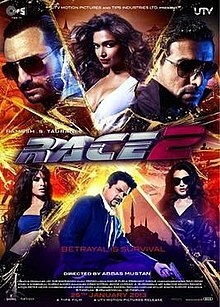 Race 2 was released in 3200 screens in India; it is the third biggest release ever for a Hindi film after Ek Tha Tiger (3300 screens) and Dabangg 2 (3700 screens). Race 2 was released in more than 50 countries, including US, UK, Gulf, Australia, Pakistan as well as non-traditional markets like Maldives, East Timor, Myanmar, Morocco and Vietnam (with as many as seven screens). The film had a simultaneous release in Morocco in four to five screens, including theatres in Casablanca and Marrakech. Race 2 is subtitled in Arabic, Thai, Bahasa, Malay, Vietnamese, and Dutch. Madhureeta Mukherjee of Times of India rated the film 3 out of 5, while commenting "Heists, hot-babes, roulette, raging cars, gizmos and gags – Director duo, Abbas-Mustan have thrown in everything with pompous grandeur, save for a riveting plot that shocks or stuns." Rubina A Khan of The First Post gave it 3 out of 5 stars, adding, "Race 2 delivers what it promises – good looking ensemble cast, exotic locations, cars, bomb squads, revenge, lust and love, a couple of good music tracks and, most importantly, a plot which unravels at a thrilling pace." Shivesh Kumar of IndiaWeekly awarded the movie 3 out of 5 stars. Taran Adarsh of Bollywood Hungama gave 2.5 out of 5 stars and said "The writing isn't watertight, the film lacks a hit score, the climax is far from effective and overall, Race 2 pales in comparison to Race." Rajeev Masand of CNN-IBN awarded it a score of 2.5 out of 5 while commenting "The film has no intellectual pretensions; its only ambition is to offer a good time. In that, it mostly succeeds." Anupama Chopra of Hindustantimes gave 2 out of 5, reviewing, "Race 2 is essentially a big-budget cartoon in which coolness is all. The director duo Abbas-Mustan have no pretensions about what they are making – full-on masala with a dash of revenge, a slice of heist and characters who are either strutting their chiseled bodies in slow motion or betraying each other." Saibal Chatterjee of NDTV gave it a score of 1.5 out of 5 and feels "This is a wreck of a movie strictly for action junkies who might be looking for a feverish two-and-a-half-hour ride that is far more giddy than heady." Race 2 had what Box Office India called a "solid opening" at multiplexes and single screens with occupancy of around 60%–70%. The film had a very good opening day, netting ₹143 million (US$2.0 million). It showed good growth in its second day, collecting approximately ₹185 million (US$2.6 million) nett and became the fourth biggest Saturday collections ever. Race 2 did well on its first weekend by collecting around ₹603 million (US$8.4 million) nett by collecting around ₹169.5 million (US$2.4 million) on Sunday.Race 2 dropped on Monday as it collected around ₹60 million (US$830,000) nett. Race 2 had a good opening in overseas with approximately ₹75.0 million (US$1.0 million) the opening weekend. Race 2 grossed approximately $5.5 million overseas in ten days. After grossing $6 million in 17 days overseas, the film was declared a hit by Box Office India. Race 2 recorded similar figures in overseas markets like its prequel. Moreover, it recorded the highest ever collection in Pakistan for any Bollywood film with an amount of $775,000 beating Don 2 which netted $675,000. Its final business in the overseas market is around $6.5 million. After making two successful films, makers planned the third Installment of this series, but as a reboot.Salman Khan, Bobby Deol, Saqib Saleem, Daisy Shah are new additions in the third installment. Anil Kapoor and Jacqueline Fernandez will return in the film from the previous parts. The third installment is Race 3. ^ Reputed trade analysts and trade magazines have put domestic nett. gross of Race 2 at ₹1 billion (US$14 million) making it first Bollywood film of 2013 to cross 100 crore club. ^ "RACE 2 (12A)". British Board of Film Classification. Retrieved 22 January 2013. ^ "Worldwide TOP TEN 2013". Box Office India. 12 December 2013. ^ "Race 2 does well in overseas markets". The Times of India. Retrieved 31 January 2013. ^ Tuteja, Joginder (26 March 2008). ""Race 2 is not ruled out" – Abbas Mustan". Bollywood Hungama. Retrieved 14 September 2011. ^ Adarsh, Taran (24 November 2009). "Saral Mondal & Anil Kapoor in 'Race 2'". Bollywood Hungama. Retrieved 13 September 2011. ^ Adarsh, Taran (29 June 2010). "The principal star cast of 'Race 2' is finalized". Bollywood Hungama. Retrieved 13 September 2011. ^ Ramsubramaniam, Nikhil (4 September 2010). "Priyanka Chopra to star in Race 2". Bollywood Hungama. Retrieved 13 September 2011. ^ Bollywood Hungama News Network (27 October 2010). "kareena replaces Priyanka Chopra in Race 2". Bollywood Hungama. Retrieved 13 September 2011. ^ "Race 2: Asin second choice after Chitrangda". timesofindia.indiatimes.com. 16 July 2010. Retrieved 24 January 2013. ^ Bollywood Hungama News Network (7 December 2010). "Sonakshi Sinha signed for Race 2". Bollywood Hungama. Retrieved 13 September 2011. ^ Shah, Kunal M (18 May 2011). "Chitrangda spices up Race 2". The Times of India. Retrieved 13 September 2011. ^ Joshi, Tushar (11 August 2011). "Ameesha Patel in Race 2". The Times of India. Retrieved 13 September 2011. ^ Pradhan, Bharathi (31 August 2011). "Ameesha Patel gets Mallika Sherawat's role in Race 2". The Film Street Journal. Retrieved 13 September 2011. ^ Adarsh, Taran (22 February 2011). "'Race 2' ready to take-off". Bollywood Hungama. Retrieved 16 September 2011. ^ Bollywood Hungama News Network (18 October 2011). "Race 2 delayed; the film was not released in May 2012 as planned earlier". Bollywood Hungama. Retrieved 18 October 2011. ^ KBR, Upala (24 October 2011). "Jacqueline to replace Sonakshi in Race 2?". The Times of India. Retrieved 24 October 2011. ^ Sharma, Amrapali (31 October 2011). "All for the camera". Mumbai Mirror. Retrieved 31 October 2011. ^ "John won't work with Bipasha in Race 2". The Times of India. 14 November 2011. Retrieved 20 November 2011. ^ Baksi, Dibyojyoti. "Won't be seen with Bipasha in Race 2: John Abraham". Retrieved 20 November 2011. ^ "Race 2: Muslim group protests against the posters - The Times of India". The Times Of India. ^ Shewakramani, Jay (31 October 2011). "Race 2 starts 5th November". Twitter. Retrieved 1 November 2011. ^ Lalwani, Vickey (10 January 2012). "Race 2 gets eight stars". Mumbai Mirror. Retrieved 7 February 2012. ^ "Sanjay Dutt not in Б─≤Race 2Б─≥". Supergoodmovies.com. 23 March 2012. Retrieved 9 November 2012. ^ Shah, Kunal M (4 February 2012). "Kareena not running this Race anymore". Mumbai Mirror. Retrieved 7 February 2012. ^ Shah, Kunal M (9 February 2012). "Dippy has no remorse". Mumbai Mirror. Retrieved 9 February 2012. ^ DC (20 February 2012). "Nargis Fakhri dragged into Race 2 controversy". Deccan Chronicle. Retrieved 9 November 2012. ^ "Deepika Padukone's back in Race 2?". The Times of India. Retrieved 17 February 2012. ^ "Visit John Abraham's home in Race 2: Turkey's superbly luxurious Mardan Palace". 8 February 2013. ^ Poddar, Shresht. "Music Review of Race 2". Archived from the original on 7 January 2013. ^ a b "Solid Opening For Race 2 at Multiplexes And Single Screens". Box Office India. 25 January 2013. Retrieved 25 January 2013. ^ "'Race 2' To Release in Over 50 Countries". Koimoi. 16 January 2013. Retrieved 16 January 2013. ^ Laghate, Gaurav (16 January 2013). "UTV to release Race 2 in 50 countries on Jan 25" – via Business Standard. ^ "Race 2 to release in over 50 countries". Indiatoday. Retrieved 16 January 2013. ^ "Race 2 to be released in more than 50 countries". Hindustan Times. Retrieved 16 January 2013. ^ Mukherjee, Madhureeta. "Madhureeta Mukherjee review". The Times of India. Retrieved 25 January 2013. ^ Khan, Rubina A. "Rubina A Khan review". Firstpost. Retrieved 25 January 2013. ^ "IndiaWeekly's Movie Ratings". IndiaWeekly. Retrieved 16 February 2013. ^ Adarsh, Taran. "Taran Adarsh review". Bollywoodhungama. Retrieved 25 January 2013. ^ Masand, Rajeev. "Rajeev Masand review". Ibnlive. Retrieved 26 January 2013. ^ Chopra, Anupama. "Anupama Chopra's review". Hindustan Times. Retrieved 26 January 2013. ^ Chatterjee, Saibal. "Saibal Chatterjee review". Ndtv. Retrieved 25 January 2013. ^ "Race 2 First Day Territorial Breakdown". Box Office India. Retrieved 26 January 2012. ^ "Race 2 Has Growth on Republic Day Holiday". Box Office India. Retrieved 27 January 2012. ^ "Race 2 Monday Business". Box Office India. Retrieved 29 January 2013. ^ "Race 2 Week One Territorial Breakdown". Box Office India. Retrieved 4 February 2013. ^ "Race 2 Second Friday Business". Box Office India. Retrieved 2 February 2013. ^ "Race 2 Has Decent Second Weekend". Box Office India. Retrieved 31 January 2013. ^ "Race 2 Has Good Second Week". Box Office India. Archived from the original on 11 February 2013. Retrieved 8 February 2013. ^ "Race 2 Week Three Territorial Breakdown". Box Office India. Retrieved 18 February 2013. ^ "Race 2 enters Rs 100 crore club". ^ "Members of Bollywood's elite Rs 100 crore club - - Photo1 - India Today -". indiatoday.intoday.in. ^ "Race 2 Is HIT Overseas: Heads For $6 Million Plus". Box Office India. Retrieved 6 February 2013. ^ "Special 26 – $1.25 Million ABCD – $425k". Box Office India. Retrieved 13 February 2013. ^ "OVERSEAS: Race 2 v Race Comparison". Box Office India. Retrieved 13 February 2013. ^ "Race 2 Emerges Highest Grosser Ever in Pakistan". Box Office India. Retrieved 6 March 2013. ^ "Shah Rukh Khan says no to negative role in Race 3? - Times of India".